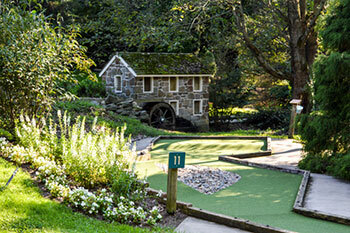 Come enjoy challenging miniature golf in a beautiful garden-like setting at Village Green. Village Greens offers two challenging courses on a beautiful 13 acres just outside of Strasburg, Pennsylvania. 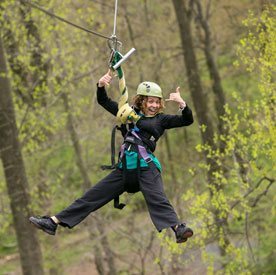 Here you and your family or friends will discover challenging holes with waterfalls, jumps, obstacles, and more. Play amid trees, gardens and shrubbery, and a flowing stream that all add to the challenge and setting. And the flowers and colors change with the seasons. Even on a hot day, you’ll feel cool in this shaded natural setting. The Orange Course – This is the more traditional 18-hole miniature golf course. Here, your challenges will include a covered bridge, a cave, a mill house with a water wheel, and other obstacles to make your round challenging, yet fun. Invite your kids to peek inside the doors on the red barn to meet some barnyard animals. The Gold Course – This challenging course is 23 holes on a hillside surrounded by mature trees, beautiful foliage, and babbling waterways. Obstacles here are more natural, such as a waterfall and jumps. Readers of Lancaster County Magazine have repeatedly selected Village Greens as their favorite miniature golf course in Lancaster County. See their photo gallery. After your round, stop by the Village Greens Snack Bar for lunch or dinner, or for old-fashioned milk shakes and ice cream. You can dine in air-conditioned comfort, or enjoy their outdoor patio overlooking the golf course. Village Greens is open late March through October, weather permitting. Their daily hours change with the seasons. Check their posted operating hours here. Check current rates for their two courses. and if you play two or more rounds the same day. 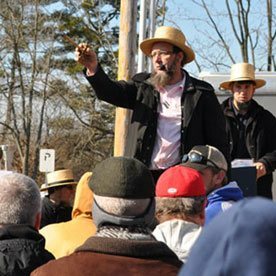 Shotgun starts are available for groups of 30 or more with advanced reservations. Village Greens is popular for birthday parties. Their birthday package includes golf, soft drinks, ice cream, and more. Check birthday package rates and details here. Village Greens Punch Ticket – When you stop by Village Greens, ask about their Punch Ticket. Play 10 games, receive 1 game FREE! 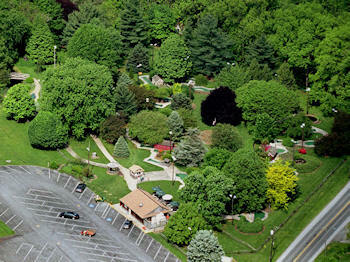 Village Greens Miniature Golf is located just west of Strasburg, PA along Route 741.